The Justice League finally assembles in the fifth DC Extended Universe (DCEU) movie. A series of movies plagued by bad reviews, but which are also box-office hits. Only the fourth movie, Wonder Woman, got a positive critical reception. I found Wonder Woman to be entertaining, but not a great movie. Certainly not up to par with the best movies from the rival Marvel Cinematic Universe (MCU). The question is if they can hold up or even improve upon the quality of Wonder Woman and finally have the DCEU come to its own. Something the fans deserve. Something that will entertain both audiences and movie critics. Justice League fails in that aspect, as well as several others. Most of the blame goes to the foundation built by the previous movies. Wonder Woman was a prequel and therefor could be a thing of its own. Justice League is a direct sequel to Man of Steel and Batman v Superman. Both rather weak movies, the latter even terrible. With such a weak foundation it would take a really talented team to create something great. The problems that took place behind the scenes are well known. The studio wasn’t happy with director Zack Snyder’s work after the two previous movies. The suicide of Snyder’s daughter forced him to step down halfway during shooting. Josh Whedon took over and rewrote parts of the movie resulting in re-shoots. One of the more peculiar things: the mustache of Henry Cavill had to be removed digitally because he was in the middle of shooting Mission Impossible 6, for which he was contractually obliged to grow a mustache. The result is several rather odd-looking scenes in which his face looks like he has had a stroke. One way they could have saved the DCEU was by giving us a great story full of characters we care about and original ideas. Sadly, originality is nowhere to be found. Justice League is DC’s version of the Avengers. But in creating their own Avengers movie they even went as far as copying the plot. A groups of super heroes fighting an alien invasion. An invasion led by a bad guy collecting several MacGuffins. In this case something called Mother Boxes. All there is missing is a sky beam in the final act. Luckily we have Suicide Squad for that. Another movie in which a group of people fight a CGI army. Justice League has another problem: the lack of character development. Three new characters are introduced: Aquaman, Cyborg and The Flash. They all have small introduction scenes which give us a glimpse of who they are and what drives them. Both Superman and Wonder Woman have their own movies and Batman is a household name. The general audience has never heard of Cyborg and Aquaman. They might know the Flash from its TV-show equivalent. These three are reduced to simple archetypes. The macho who can swim, the nerdy kid who is really fast and a Cyborg who has a difficulty accepting what he has become. They remind me of extras in the X-Men movies who would often pop up in a certain scene where they utilize their mutation. The Flash is as much developed as a character as Quicksilver was in the last two X-men movies. A fun character, but you don’t really care for him. Before I get to the redeeming parts of the movie, I want to point out another weak element: the special effects. I already covered the mustache, but there are plenty of other elements in the movie full of weak special effects. Cyborg is largely CG, with only Ray Fisher’s face partially visible. Somehow his head always seems to float instead of being an actual part of his body. Sometimes the CGI is totally unnecessary, like a helmet falling on the floor. As if it is that hard to actually make a helmet and drop it. Scenes in which a CGI tentacles are chasing people look like they are stop-motion. The villain, Steppenwolf, is also a fully CG character. But his appearance does not warrant it. Whatever happened to good old fashioned make-up? But not all is bad. Justice League is certainly a step up compared to Batman v Superman. The changes and additions Whedon did to the story and tone do pay off. It is obvious he did a lot of dialogue rewrites, injecting humor into the script. 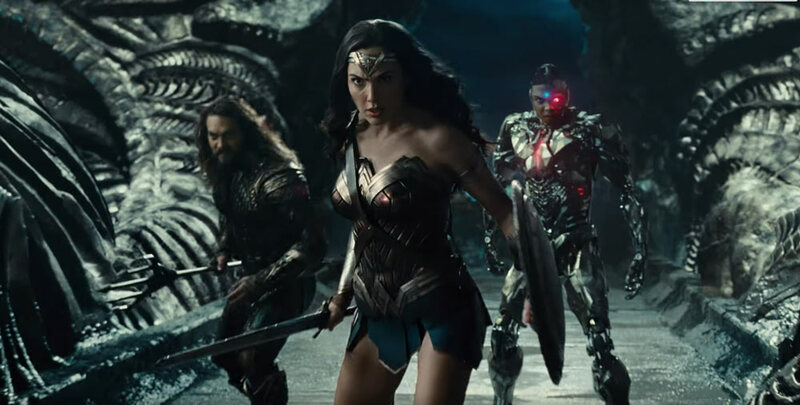 Justice League is light on its feet and dedicates only a small portion of its running time to brooding characters. The running time is also significantly shorter than the previous DCEU movies. Including end credits the movie is about two hours long. It’s a light-hearted comic book movie. One that stands out in its own universe for being rather colorful. But its overshadowed by the movies from the MCU. Just three weeks before the release of Justice League, Thor: Ragnarok came out. A far more superior movie. Justice League is certainly watchable. Way more than Suicide Squad and Batman v Superman. It just never reaches its potential. There are six super heroes in this movie. Some of them household names. This is supposed to be the DCEU’s magnum opus. Instead all we get is a Magnum Adequatus.